Normally our Design of the Month article includes a downloadable pattern, but the owners of this window requested that we not make it available. The story is fascinating enough that we decided to proceed with the article even without the pattern. We gave away four patterns last month, and we hope that offsets not having a pattern this time! 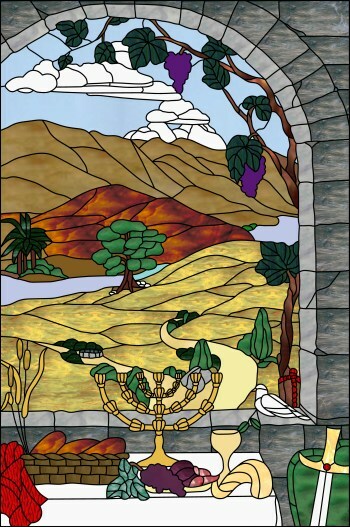 Back in 1986 my mother built a copper foil stained glass window for a private chapel, and the window served as an inspiration to all who saw it. 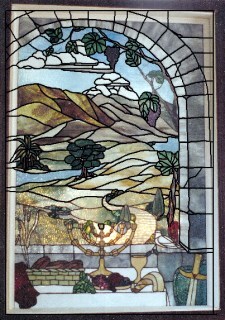 The design depicted a view from a window onto an Israeli mountainside. The items in the design had direct scriptural references. In summer of 2010, the chapel caught fire and a firefighter was forced to destroy the window with an axe to let toxic smoke out of the building. My mother was informed that her window, which had stood for 24 years without a single crack, was now in hundreds of pieces. 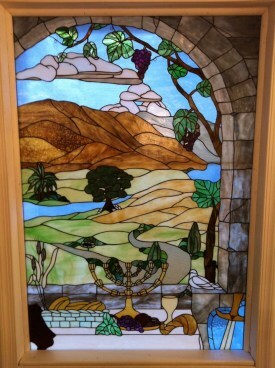 She had retired from working with stained glass 12 years after building the window. I was looking for a hobby in 2006, and decided to pick up the craft where my mother left off. She still had large quantity of glass and most of her tools. In 2007, I purchased Glass Eye 2000 to assist me with my stained glass patterns. I really liked the fact that you could import a photo and use the software to trace a pattern. 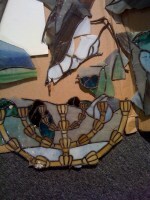 I needed a stained glass window to practice with, and just happened to find a photo of my mother's undamaged window. Thankfully, the software was very easy to learn, and after a few hours I had most of her window drawn. I was going to finish the pattern and email it to her as a surprise because she lost the original pattern when their house flooded in Houston several years ago. I got busy with work and never finished the pattern, but saved it for a later date. When she called me to tell me that the window had been destroyed, I immediately opened up the software and pulled up the file. It only took a few additional hours and we had a perfect pattern to work from. Being a full time firefighter, I chuckled a little bit wondering if the guy on the end of the axe knew how many hours of work he was about to destroy. She was reluctant to start the process because the owner wanted the window rebuilt to the same pattern, but since the software solved that problem we began working on the project. 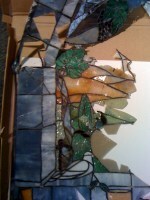 The hardest part of the process was finding glass to match the original window. It was all built with the highest quality art glass, and most of the colors were no longer in production. Midway through the build, I was burned fighting a house fire. I had to be pulled through a window by another firefighter, and when we went back to the house after the fire, I put a few pieces of the broken glass in my pocket. We used a small piece of that glass in the new chapel window in one of the sheep under the large tree at the center of the window. Once I recovered from my burns, we went back to work on the window and had it installed a few months later. The new window is almost identical to the original, and Glass Eye 2000 played a big role in helping us to complete the project. 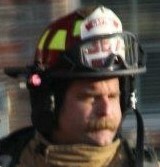 John Wright is a full time Fire Captain with a department near the DFW Metroplex. He grew up watching his mother build windows, and learned at an early age not to chase the pretty globs of solder rolling across the table. He took up the family business in 2006 and learned to make on-site window and door repairs for residences and businesses. The birth of his son put a halt to his repair business, but recent renovations to his home will allow for future projects. You may reach John by email.